Boyds bear 13" plush and little Bentley 5" Navy/tan plaid bear with boe tie that matches Savannahs dress (He was at Grandmas when this picture was taken). 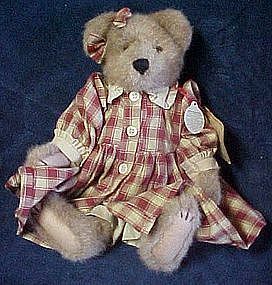 Sanannah Berrywinkle is in tan cotton pants, red & tan plaid dress and matching hair ribbon. Both are in perfect condition with origial hang tags. She is now retired as of 1997, and was a QVC exclusive. Hard to find.